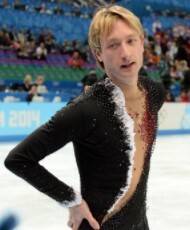 Russian skating star, Evgeni Plushenko wowed crowds at the Motorpoint Arena, Sheffield this afternoon when he took the gold medal with a stunning combined score of 261.23 points to become the 2012 Men’s European Champion. After finishing in second place for his Short Programme with 84.71 points, Plushenko impressed judges in his Free skate to receive a score of 176.52 points, earning him his seventh Men’s European Championship title. Plushenko took the lead from Russian team mate Artur Gachinski who was in front following the Short Programme on Thursday with 84.80 points. Gachinski took the overall silver medal with a combined score of 246.27 points. Taking the overall bronze European medal was reigning Champion, Florent Amodio of France with a combined score of 234.18 points. Belgian skater, Kevin van der Perren withdrew from the Men’s Free Skating at the ISU European Figure Skating Championships 2012, following the warm up, citing injury. The Ladies European Champion 2012 was also decided today with World silver medallist, Carolina Kostner of Italy claiming the title with a combined score of 183.55. After earning 63.22 points in her Short Programme, Kostner led the Ladies going into the Free skate and went on to claim the European title for the fourth time with a 120.33 point Programme. Taking the overall silver and bronze European medals were Finnish skater, Kiira Korpi and Elene Gedevanishvili of Georgia with 166.94 and 165.93 combined scores respectively.